Roundhead or Cavalier? 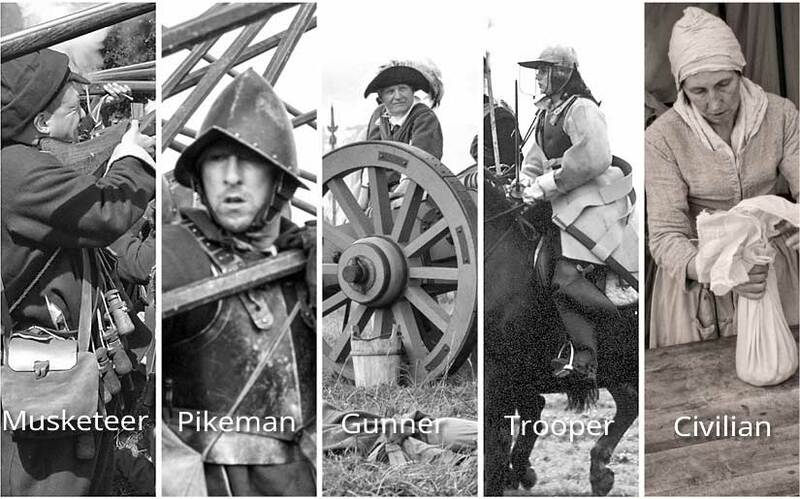 Musketeer, pikeman, artilleryman or horse trooper? Or perhaps you would prefer a non-combat role as a drummer or camp-follower or demonstrator of a 17th century trade or craft? The choice is yours when you step back into the 1640s as a member of the English Civil War Society. You can read about the types of events you may become a participant in on the What We Do page but don’t forget that the staged events are only one part of your experience. We are a society with members from all walks of life and we fully enjoy the social aspects of renewing old friendships and making new ones when we are ‘off duty’. To take part in our events you will need to join one of the ‘regiments’ of either the King’s Army (Royalist) or the Roundhead Association (Parliamentarian). The easiest way to enquire about joining is to make an enquiry using the form at the bottom of this page. This will allow our regimental officials to send you information that may help you make a choice about which one to join. Or come to one of our events and talk to the participants about joining. Jumping into a new hobby that entails working and socialising with a group of possibly eccentric people can sound a bit daunting but you need have no worries. There will always be somebody to look after you while you are finding your feet. Most of our regiments offer a trial membership that is free or subsidised and you can use this to discover whether our hobby is right for you too. Our regiments are not regionally based and all of them recruit nationally. The majority of events take place in the warmer months and we always offer free camping with toilet facilities and water points. At larger events there are usually take-away food franchises, a beer tent and traders selling everything coveted by enthusiastic re-enactors. Please visit the pages below to review the list of regiments within each army.